Justices voted along ideological lines. President Obama's landmark regulation to cut emissions from stationary polluters -- the Clean Power Plan -- was just issued a stay by the U.S. Supreme Court. The decision to pause the program casts doubt on whether the rule will ultimately be upheld. The 5-4 vote (PDF) shows the justices voting along ideological lines, with Justice Ginsburg, Justice Breyer, Justice Sotomayor and Justice Kagan stating they would deny the application. It's a black eye for the Obama administration, which finalized historic carbon regulations on new and existing power plants last August. The rule seeks to cut pollution from the power sector by 32 percent by 2030 and spur investments in clean energy. A number of states, utilities and fossil fuel companies had requested to block the CPP, making assertions of irreparable harm, even in these early planning stages. Texas and West Virginia led 23 other states in challenging the U.S. Environmental Protection Agency rule the day it was published in the Federal Register. Opponents, now up to 27 states, say the EPA overstepped its authority in implementing the regulation, which they say would force states to transition their energy portfolios away from coal power. Opponents brought the motion for a stay to the Supreme Court after a federal appeals court rejected a bid to delay the rule on January 21. Environmental groups argued there was no merit for a stay, pointing to the recent appellate court decision. "The request for a stay has no basis in fact and should be denied, and that’s exactly what the federal appellate court in Washington did two weeks ago," said David Doniger, director of the Natural Resources Defense Council's climate and clean air program, in a statement last week. "Ultimately, we believe we will prevail in this case on its legal merits, which is that the Environmental Protection Agency has the authority to issue first-ever restrictions on carbon pollution from power plants, the primary driver of dangerous climate change." Clean energy supporters maintain the CPP will withstand ongoing legal challenges. Power plants do not officially have to start making carbon cuts under the CPP until 2022, at which point the requirements phase in gradually through 2030. Proponents claim the rule offers even more flexibility by allowing for emissions trading and multi-year emissions averaging, among other approaches. However, challenging parties argue that the rule is already prompting states to write compliance plans and forcing power companies to make decisions on whether to retire coal-fired power plants, or avoid making investments in new plants. William Becker, executive director of the National Association of Clean Air Agencies, which represents the state regulators charged with implementing the carbon rule, said that efforts to reduce greenhouse gas emissions will not stop because of the Supreme Court decision. The stay is expected to last through much of the year, until the U.S. Court of Appeals for the District of Columbia Circuit makes a final ruling on the plan. A decision in that case is expected in late 2016 or early 2017. 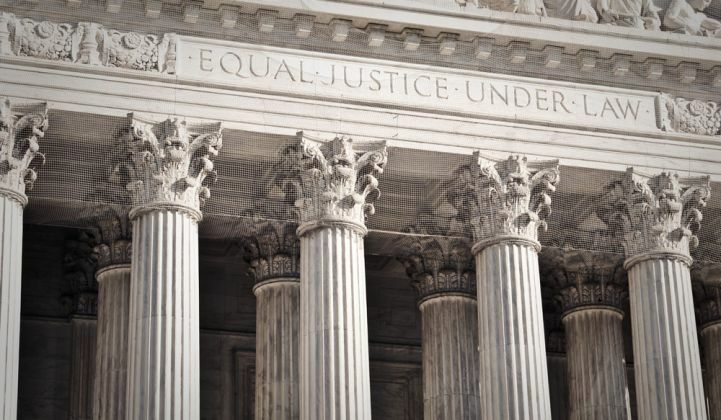 Regardless of the outcome, the decision is likely to be appealed by either foes or proponents, and sent to the Supreme Court for a full merit review. The 5-4 vote to stay sends a worrying signal to the EPA on how the high court could ultimately rule. As Obama’s final term winds down, his legacy on clean energy and climate is very much in the courts.